This sunday, the opening ceremony of the Hannover Messe was attended by The Dutch Prime Minister Mark Rutte and the German Chancellor Angela Merkel. The Hannover Messe is the largest industry trade fair of the world, at which Holland is represented by 270 companies and educational institutions. 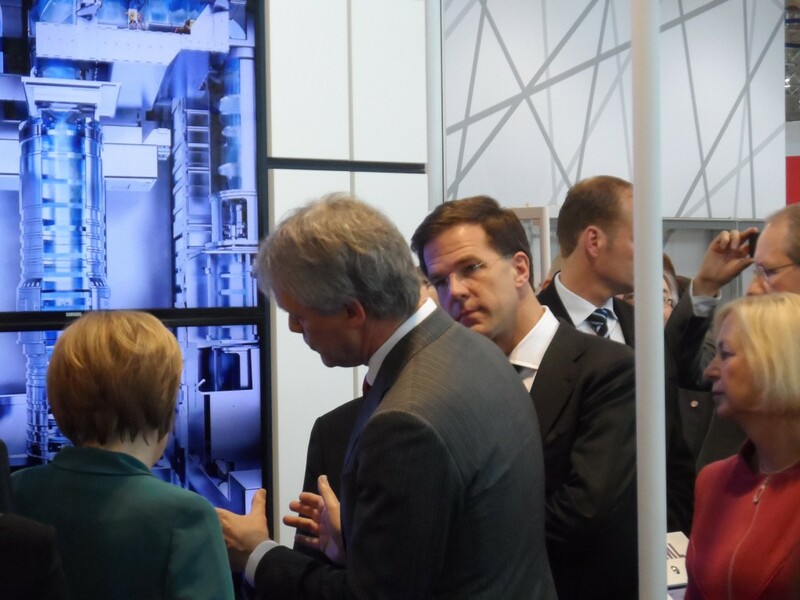 Amsterdam Scientific Instruments is also attending the Hannover Messe this year and spotted Rutte and Merkel while they were visiting the Holland High Tech Stand. This year, the Netherlands and Germany are hosting the event together. Prime Minister Rutte held a speech in German. “It is wrong to only associate The Netherlands with tulips and cheese”, he said. Rutte sees the Hannover Messe as a great opportunity to show the world that Holland is a country of “inventors, creative minds and resourceful engineers.” In his speech, he also praised the close cooperation between German and Dutch innovative companies like Philips and ASML.